Petru Susanu, 39, of Vladeni, Romania, has been a fugitive from justice for four years. After he was convicted of robbery in 2005, he fled and went into hiding. 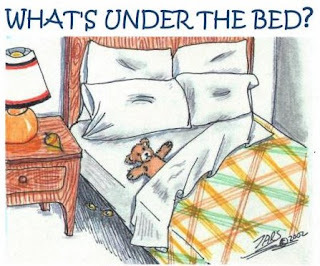 This week, Petru was found-- hiding under his mother's bed. It seems that Petru created a small living space under his mother's bed by using carpets and boards. He has been living under there since 2005. Petru was finally discovered because people began to wonder why his mother was buying cigarettes and beer. After all, she doesn't smoke or drink. Not only that, she was buying them from a store that Petru used to rob regularly. She even bought his brand of cigarettes. Petru is now facing the original jail sentence with additional time for escaping justice. good news for Petru: Mom may be able to get the top bunk when she is convicted for harboring a fugitive. I find a lot of prisoners under my mom's bed. She sure is a scallywag.